The 1973 spy film, Scorpio, directed by Michael Winner (Death Wish), might not be on the AFI top 100 or be what actor and star Burt Lancaster is most remembered for, but one scene provides a glimpse back into the past. 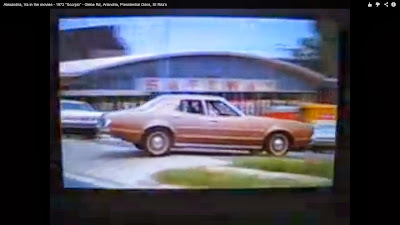 During one chase scene (which is surely the most memorable part of the movie), we can witness Lancaster turn left from Russell Road in front of Presidential Greens Apartments, head east on West Glebe Road and into the then thriving Safeway parking lot on the corner of Mt Vernon Avenue. St. Rita's Church is clearly visible behind. Burt (as his friends called him...and we're practically neighbors at this point) heads into the store and buys what I'm guessing is a bottle of red wine vinegar.